Parotid tumors are slow-growing tumors which are the one of the most common types of salivary gland tumors. Parotid tumors account for almost 85 percent of all salivary gland tumors --- that is, tumours which can get triggered in any of the salivary glands in your mouth, neck or throat. Parotid tumors are generally non-cancerous (benign) tumors, but nearly 25 percent of these tumors can be malignant (cancerous). 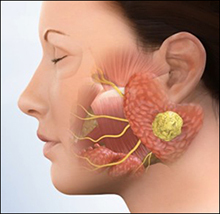 Parotid tumors affect the parotid glands which are located on both sides of the face, just in front of the ears. These glands comprise a large set of major salivary glands under and behind the jaw. The main responsibility of these glands is to produce saliva, for assisting the process of chewing and digesting food. The exact cause of the occurrence of Parotid tumors, or other salivary gland tumors, is not known. Nonetheless, doctors are aware of the fact that most of the salivary gland tumors occur when some cells in a salivary gland develop mutations in their DNA. People affected by Parotid tumours may usually show a variety of signs and symptoms, which commonly include a mass or swelling in or near their jaw region. The swelling may or may not be painful. A physical exam of the jaw, neck and throat for ascertaining lumps or swelling. Biopsy or collection of sample of tissue for laboratory testing to find out whether the tumor is cancerous. Imaging tests like Magnetic Resonance Imaging (MRI) and Computerized Tomography (CT) to determine the size and location of the tumor. The most preferred treatment for Parotid tumors is surgery (parotidectomy) for removing all or a part of the parotid gland. In the case of malignant Parotid tumors, doctors may also recommend radiation therapy. The standardized extract of the ‘Ashwagandha’ herb (Withania somniferum) are used to prepare these capsules. The herb is widely used in Ayurvedic formulations due to its proven anti-inflammatory properties and immense medicinal value. The use of these capsules is beneficial in managing Central Pain Syndrome because they can manage inflammation, support nerve functions, reduce metabolic imbalances, strengthen the muscles, rejuvenate the body, and balance the body’s Vata and Pitta doshas. Dosage: 2 capsules twice a day, with plain water, after meals. These capsules are prepared from the Curcumin which is one of the main active compounds of the rhizomatous herb of Turmeric (Curcuma Longa). Hence, each of these capsules is packed with the standardized extract of Turmeric which has amazing medicinal properties. Turmeric is widely known for its antioxidant and anti-inflammatory properties. The use of Curcumin capsules have the ability to reduce inflammation, manage nerve pain, treat muscle aches, manage swelling in joints, reduce stiffness of joints, provide relief in muscular disorders, manage allergies, and treat musculoskeletal diseases. Dosage: 2 capsules, times a day, with plain water after meals. These tablets are prepared from a combination of useful herbs which can be extremely beneficial in managing several health conditions. 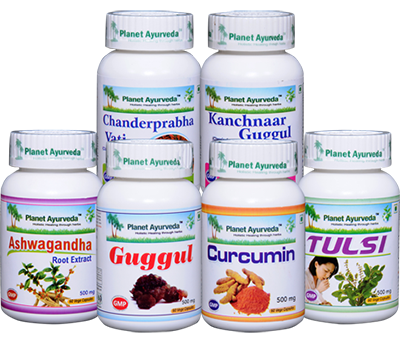 The herbal components of these tablets include: Kanchnaar (Bauhinia variegate), Haritaki (Terminalia chebula), Bibhitaki (Terminalia bellerica), Amalaki (Emblica officinalis), Ginger (Zingiber officinale), Pippali (Piper longum), Black pepper (Piper nigrum), Guggulu Resin (Commiphora mukul), and Varuna (Crataeva nurvala). These tablets are very useful in managing a number of conditions including Tumors/Cancers, Lipoma (tumors consisting of fatty tissue), Liver cysts, Polycystic kidney disease, Fistula, Skin diseases, and several other conditions. Dosage: 2 tablets with plain water, three times a day, after meals. For preparing these capsules, the pure and natural extract of the extremely beneficial ‘Tulsi’ herb (Ocimum sanctum)are used. The herb is considered a natural immuno-modulator; and has proven effectiveness in managing Cancers, Auto-immune disorders, Diabetes, Skin and other allergies, Chronic Sinusitis, and Chronic Rhinitis. Tulsi capsules can work as an excellent immunity enhancer, reduce the negative effects of environmental toxins (including cancer), and provide the body with abundant bio-available antioxidants, calcium, and vitamins A and C.
Dosage: 2 capsules two times a day, with plain water after meals. These capsules are prepared from standardized extract of the Guggul (Commiphora mukul). Guggul is a gum resin which is a purely natural substance obtained from the Commiphora mukul tree. The use of these capsules is very helpful in natural treatment of any kind of pain or inflammation, especially pain, swelling or stiffness in joints. The capsules can be taken as a natural health supplement on a regular basis because they are beneficial in maintaining healthy bones and joints, supporting healthy muscles, relieving numbness, keeping the blood circulation healthy, and balancing the body’s Vata, Pitta, and Kapha doshas. These tablets are prepared from a combination of potent herbs which include: Karpura (Cinnamomum camphora), Shilajit (Asphaltum), Guggulu (Commiphora mukul), Vacha (Acorus calamus), Mustak (Cyperus rotundus), Haritaki (Terminalia chebula), Vibhitaki (Terminalia bellirica), Amalaki (Emblica officinalis), Haridra (Curcuma longa), Danti (Baliospermum montanum), Chavya (Piper chaba), Vidanga (Embelia ribes), Tejpatta (Cinnamomum tamala), Dalchini (Cinnamomum zeylanicum), Pippali (Piper longum), Shunti (Zingiber officinalis), Maricha (Piper nigrum), Ela (Elettaria cardamomum), Yavkshaar (Potassium carbonate), Sarjikshaar (Sodium carbonate), Saindhava Lavana (Rock salt), Sauvarchala Lavana (Sodium sulphate), Sharkara (Sugar), and Vida Lavana (Black salt). The herbal components of Chanderprabha Vati tablets are extremely effective in eliminating toxins from the body, purifying the blood, treating cysts, shrinking fibroids, and managing bladder-related disorders. Dosage: 2 tablets, three times a day, with plain water, after meals. 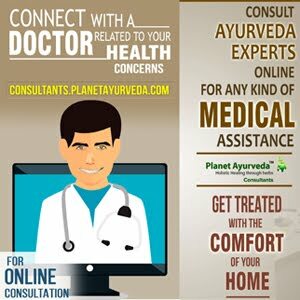 Planet Ayurveda's products for managing the symptoms of Parotid tumors are completely safe and natural Ayurvedic formulations, prepared from 100% pure herbs. The products are free from any type of chemicals, starch, yeast, binders, fillers, additives, or preservatives.